Grant Solutions is a national consulting company (headquartered in Melbourne) specialising in obtaining government grants for businesses. We’ve found that while businesses excel in their day to day activities, they are unaware of available grant opportunities. The businesses that are aware of government grants simply do not have the resources and experience to adequately prepare an application. Despite spending valuable resources, jumping through hoops and filling out mountains of paperwork, most are unsuccessful in obtaining grants. 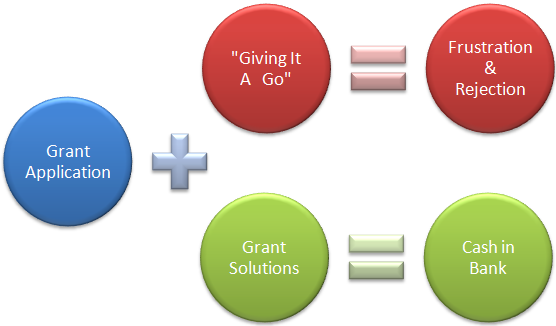 Grant Solutions solves this problem by submitting grant application on behalf of clients... successfully getting the money. 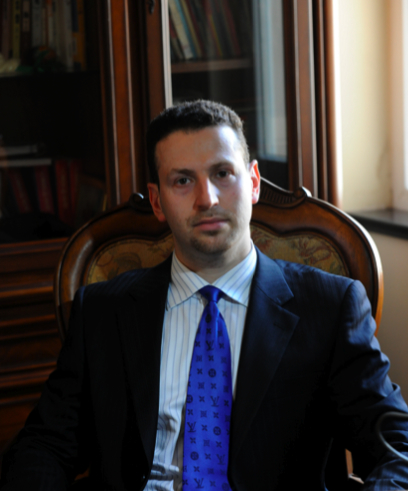 Below is a brief video of Ross Turetsky, the Managing Director, talking about the company and its origin. Ross is the founder and Managing Director of Grant Solutions. Prior to establishing Grant Solutions, Ross worked in many industries including Management Consulting, IT, Education, Banking and the Public sector. He has recently completed an MBA at the Melbourne Business School and plans to study a 4th degree - Masters of Marketing. Ross has been fortunate to receive several scholarships (to study in US, China and UK) and has completed the highly regarded Project Management accreditation (Prince 2). Ross is recognised as one of Australia's experts in government grants. He guest-lectured at Monash University and was invited to appear on national television (Channel 7). Ross is also widely quoted in the business media (The Age, Sydney Morning Herald, Brisbane Times, BusinessDay) and occasionally presents at national and international conferences. He is currently writting a book on the subject (to be released in 2013). In his spare time, Ross enjoys cycling, swimming and being a passionate speaker in his 2 public speaking clubs (where he has won awards at the national level). Passion, energy and the "tenacity to succeed" is something you'll no doubt experience when you work with Ross. Jasmin is the Financial Controller at Grant Solutions. She has substantial experience in the Finance and Accounting industry while currently completing a Certified Financial Planner certification. 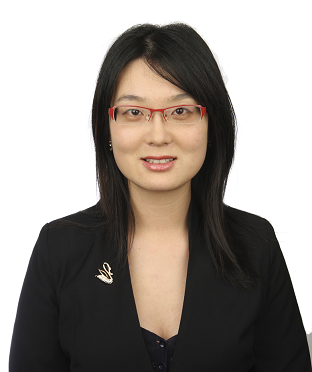 Jasmin is responsible for internal auditing, tax, financial planning and company forecasting. She also assists with quality assurance, strategic planning and marketing. Ross and Jasmin rely on a team of highly capable consultants who work on specific client projects. Prospective clients often inquire about the origin of Grant Solutions – where did the idea come from and how the company started. It’s the type of question we like to answer, taking us back in time to the start of this journey. Our founder, Ross Turetsky, participated in many business plan competitions while completing his undergraduate degrees at Melbourne University. Over time he developed an uncanny ability to communicate the value of projects – which led to winning many prizes and scholarships. Developed an innovation framework for a 'Big 4' bank. Consulted (as a Senior Business Analyst) to 10 state government departments and worked on 37 different projects. So when a friend asked for assistance in getting a $50,000 government grant from a local council, Ross seized the opportunity and successfully got the money. When golf courses were eligible for water grants in 2007, Ross cold-called 97 Victorian golf courses regarding this opportunity. Surprisingly, most were not interested - even though the service was offered on a “no win, no fee” basis (clients didn’t have to pay anything until they got the money). Only 3 golf courses decided to go ahead (and 2 of these clients later changed their mind). So after spending 4 weeks talking on the phone, Ross was left with 1 client (who unsuccessfully applied for this funding 4 times previously). Things were not looking good at this stage…. but 3 months later the application was successful and the client got around $150,000. Ross went back to the 96 golf courses and this time signed up around 20 clients, who were now very interested! Sadly the funding was withdrawn due to a change of Federal government … much to the disappointment of everyone involved. 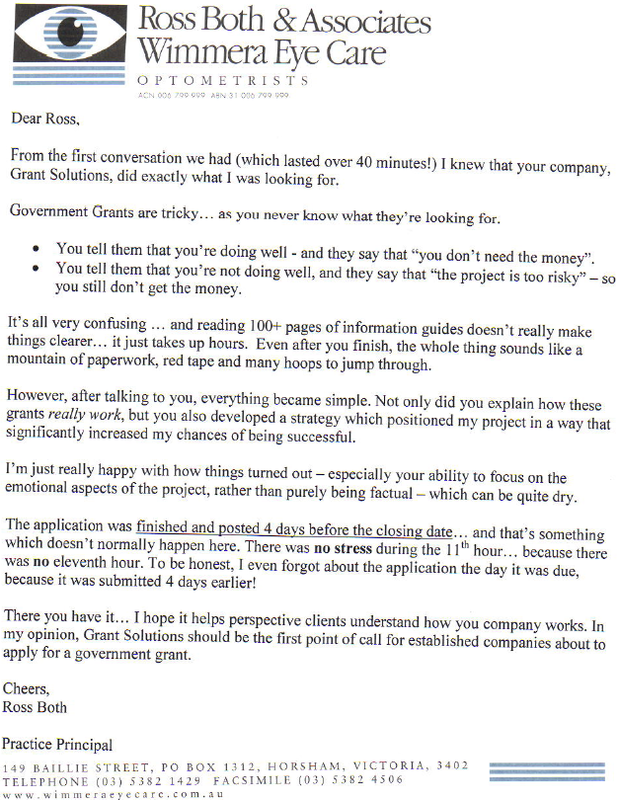 Yet despite this, Ross saw an opportunity – and 1 month later Grant Solutions was born. Things have changed significantly over the last 5+ years. For example, Grant Solutions is often booked out due to repeat business, client referrals and interest arising from media publications (where we are featured).